Welcome to Blog #4 - the Special Needs Learner. I hope that you are enjoying this Series. In Blog #1, we explored the Visual Learner. In Blog #2, we looked at the Auditory Learner. In Blog #3, we discussed ways to support the Kinesthetic Learner. Here, in Blog #4, I would like to look at the Special Needs Learner. The 3 main Learning Styles are the “VAK” – Visual, Auditory and Kinesthetic. I feel that often there are FOUR Learning Styles – the VAKS – Visual, Auditory, Kinesthetic and Special Needs. 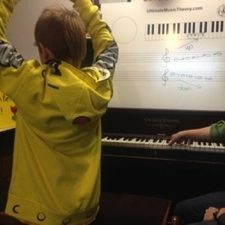 What is the definition of "Special Needs"
The joy of teaching music and theory is that children of ALL Learning Styles can learn! In order for Special Needs Students to be successful, the Teacher is often required to “think outside the box” to meet the Special Learning Needs of the Student. Special Needs Students will find Pentascales a lot of fun and easy to learn. For students with tracking issues (including dyslexic tendencies), write the Pentascale on the Large Teacher Whiteboard. Then use coloured arrows between the notes to show direction. A “blue” arrow can be used for ascending pitch (the blue sky is up in the air); a “green” arrow can be used for descending pitch (the green grass is down on the ground). Have your student point to the notes on the music while they play the pattern on the piano to reinforce direction. For your students with ADHD, ADD and other attention/focusing disabilities, the Pentascale Pattern of Five Notes is easy to remember. It can be “played” on one hand. Have your student “air play” (play in the air using their fingers) with one hand while they point to the Pentascale Pattern with the other. Feeling the pattern on their fingers (without the added distraction of the sound) is a good place to start. Once they are comfortable feeling the pattern, introduce pitch! Singing the scale degrees (1 – 2 – 3 – 4 – 5) in an ascending pitch for an ascending pattern (or 5 – 4 – 3 – 2 – 1 using a descending pitch for a descending pattern) will enable your student to hear, see and feel the Pentascale Pattern. The body can also become involved – students can stand taller and taller as the Pentascale ascends, and then can crouch smaller and smaller as the Pentascale descends. Play a game with your Student! Have them turn away from the Keyboard. Play ascending or descending Pentascales. Have the Student move their body in the direction of the Pentascale (up tall or down small). This reinforces Ear Training. 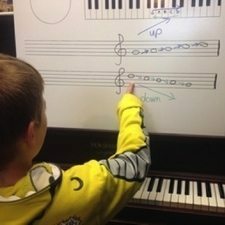 Use your Large Teacher Whiteboard to reinforce theory concepts at the piano. The dry-erase marker is so easy to erase if your student makes a boo-boo. One swipe of the eraser and they can fix it or start again. 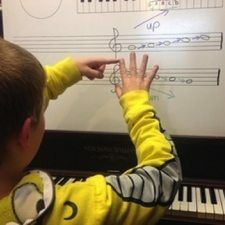 Whether a Student is a Visual, Auditory, Kinesthetic or Special Needs, Ultimate Music Theory is the Way to Score Success! This is a "must" for Piano Parents of ALL students, especially Special Needs Students. There are so many options to pre-set the app to work on flashcards that the student is struggling with. My students really find it rewarding - and so do their Parents! 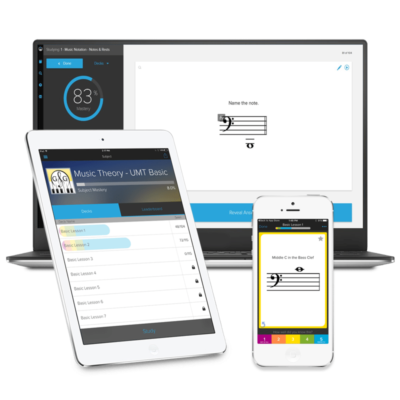 Get the Ultimate Music Theory App and Learn Faster! The articles on learning styles are really good and most of these are things I use with my students. I hadn’t tried the ‘air play’ on their fingers for the scales though. That’s a really good idea. Many of my students have “learning disabilities” and have you ever noticed how many times the students disability is something that interferes with their first or natural learning style? Many of these students are forced to rely more on their secondary learning style which doesn’t come as easily to them. For example: I’ve noticed in my studio that most of the students with dyslexic type of learning disorders are visual learners. There are many successful strategies to work with this but it’s just an interesting thing I’ve noticed since I started using UMT when I started learning more about different learning styles and how to teach them. For curiosity I started keeping track of my students learning styles and what their disabilities were. Then I noticed how often the disability interferes with how they naturally tend to learn.